[ Augustus Short, Bishop of Adelaide. ] Two Autograph Letters Signed (both 'A Short'), written while at Oxford to Rev. Richard Harington, regarding the Oxford Movement and 'Schismatics', and reporting a comment by John Henry Newman. Neither with place or year [ 1840s ]. One 'Wednesday. Mh. 13. '; the other 'Tuesday | June 4'. Both items in good condition, on lightly-aged paper. According to Short's entry in the Oxford DNB, he 'had many friends among the Tractarians, and wrote (but did not publish) a defence of Tract 90, though he voted for the condemnation of W. G. Ward's Ideal of a Christian Church in 1845. In 1846 he delivered at Oxford the Bampton lectures entitled The Witness of the Spirit with our Spirit'. ONE: 'Tuesday | June 4'. 3pp., 12mo. He begins by stating that he is enclosing the 'Extracts from the Tracts', together with Harington's 'paper of observations'. 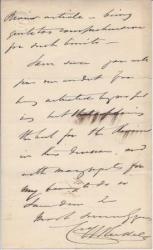 Long Autograph Letter Signed ('Chas W Russell') from Charles William Russell of Maynooth College, regarding an article by his correspondent for the Dublin Review. 27 April 1852; St Patrick's College, Maynooth, Ireland. 12mo, 5 pp. 78 lines. Text clear and complete. Fair, on aged paper. His unnamed correspondent's paper was sent to Russell 'by Mr Bagshawe, who expressed his opinion that it would not suit our pages'. Gives his reasons for concurring with Bagshawe, and thinking that the paper 'would to our readers be heavy & uninteresting'. 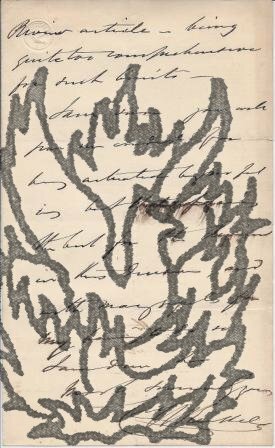 Substantial Part of Autograph Letter Signed [to Charles Dolman], Catholic Bookseller/Publisher. No date (but 1853); on letterhead '8 York Place | Portman Square | London W'. Four pages. 16mo bifoliate. In poor condition: grubby, creased, stained and worn. Traces of previous mounting along top of two central pages, and of stub along one edge, removal of which has caused a small hole (not affecting text). A letter to the publisher of his 'Essays on various subjects' (3 vols, 1853): '<...> sermons, I have "50 Heaven" "Means of salvation" being "49." | Either therefore our lists do not agree, or one of us has made a mistake. English novelist (1823-1901). Paper dimensions: 1 inch by 4 1/4 inches. Paper creased, browning and with discoloration from previous mounting. Reads 'Your most loving | C M Yonge'. On reverse: 'More of a woman She | might do something'.